Carina is featured in today’s The List Magazine’s article together with Tom Kitchin, Dominic Jack and Fred Berkmiller. They have all shared their favourite Scotch Lamb recipes. Below is Carina’s recipe. Scottish Highland, Shetland or Borders lamb is a Sunday treat in our house. 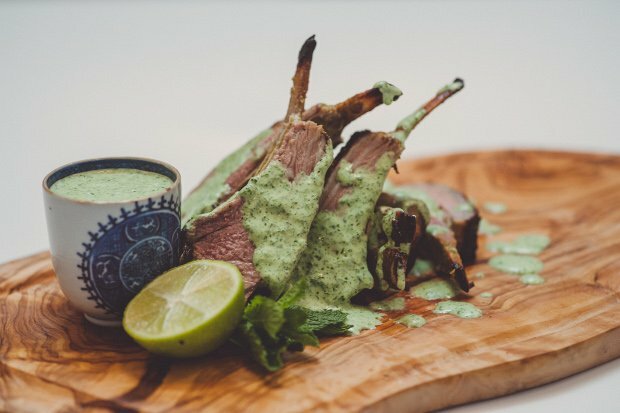 I prefer to eat lamb slightly later in the year so the flavour is a little deeper and the legs just slightly bigger. The classic marriage of garlic and rosemary with lamb will never go wrong, but this recipe takes the flavours to a whole new level. First make the marinade. Blend all the ingredients in a blender or food processor. Pour half over the lamb and refrigerate for up to 24 hours. Keep the rest in the fridge. Remove the lamb from the marinade and leave to rest at room temperature for about 30 minutes. Preheat the oven to 220°C/425°F/Gas 7. Heat a griddle pan over a medium to hot heat. Add the lamb, skin side down and sear until golden and caramelised. Turn the lamb over and cook on the other side until the meat is coloured all over. Transfer to a roasting tray and roast in the preheated oven for 20 minutes. The lamb will be medium rare. Cook for longer if you prefer the meat to be less pink. Remove from the oven, leave to rest for 5 minutes, then cut into chops. Serve accompanied by the remaining chilled marinade and some lime halves. First make the dressing. Blend together all the ingredients except the salt and pepper in a blender or food processor. Season to taste.